Barack Obama waited four years to release a long-form birth certificate to prove he was born in Hawaii, even if it proves on its face he was not a natural born citizen because it confirms his father was not a U.S. citizen, which made him a dual citizen. No, dual citizens are not natural born citizens, but we won't waste your time on that since the Omedia has declared the U.S. Constitution means something no federal court has ever said it means. To the point of this post, only a day after America learned former California Gov. Arnold Schwarzenegger fathered a love child with a domestic worker who worked in his home more than a decade ago, the media has obtained the long-form birth certificate for the child. No, Arnold is not listed as the father. ah well; at least he admits that obama was born in the US, even if his understanding of citizenship is wrong. More importantly, the Omedia could care less that the document posted on the official White House website and represented as Obama's true long-form birth certificate is a total fraud and has been proven such by numerous document experts who have examined it. got that? obama's long-form birth certificate, which "proves on its face he was not a natural born citizen", "is a total fraud and has been proven such by numerous document experts". gary doesn't bother to post links to any of these document analyses, nor does he explain how a fraudulent document can prove anything. fortunately, melyssa turns up in the comments and links to this video, citing it as "absolute proof" that obama's long-form birth certificate is a fake. yes, the document is a fake because "it uses kerning". KERNING PROVES IT! 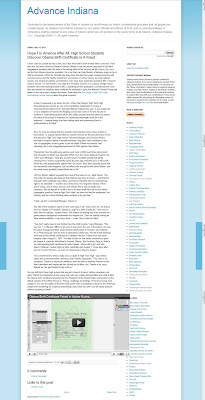 for good measure, melyssa stops by my blog and posts the same link here, asking "Refute the kerning on his birth certificate, please. I'll listen." melyssa is presumably old enough to have used a few typewriters in her day—i sure am—but seems to have forgotten what it was actually like. due to their analog nature, they were imprecise machines. they didn't produce perfect, consistently aligned text like today's word processors do. any number of factors could affect the relative spacing between characters. for example, blogger paraleaglenm—who's no fan of president obama—was able to reproduce this supposedly "impossible" kerning by varying how rapidly the letters were typed. hunt-and-peck typing produced wide spacing between letters, whereas typing in rapid succession resulted in letters that were much closer together. after posting this morning about the delete, accept, and deny cookie stamps i'm selling on etsy, i spent a fair part of the afternoon perfecting my "dipping" technique so i could make these chocolate-dipped delete cookies! these beauties start with a sugar cookie base but kick it up a notch with a thick layer of semisweet chocolate. the result is similar to something you might get from pepperidge farm, but fresh-baked instead of store-bought. my wife fell in love with them instantly—and to be frank, she'd been getting sick of cookies lately, as i made countless batches of them while developing the stamps... and we're supposed to be dieting! for the chocolate, i just melted some semisweet chocolate chips. you could use baking chocolate, higher-grade fancy chocolate (dark, white, milk, etc), or go in a different direction and use candy coating, butterscotch, or whatever... as long as it will be solid at room temperature. for the molding process, i found it best to lay the cookie stamp on my work area, stamp-side up, and spread melted chocolate onto the cookie stamp so that it covers the text. then i pressed a prebaked cookie onto the chocolate, flipped the whole thing over, and put it in the freezer for a few minutes to make it set more quickly. 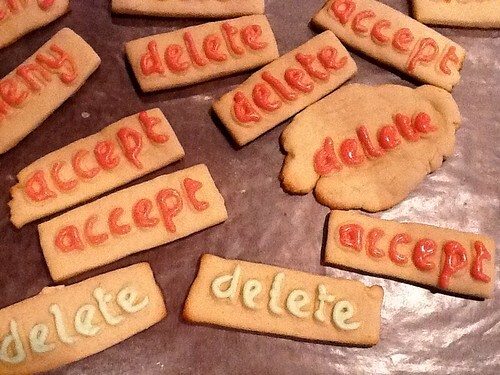 bake your own delete cookies! 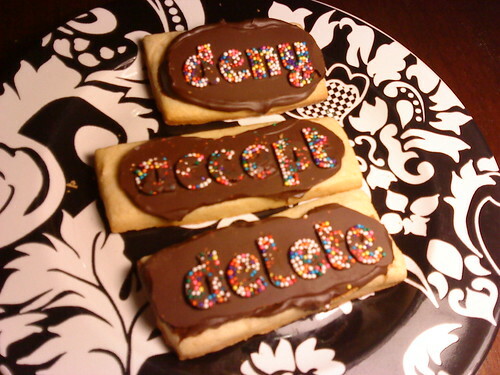 i'm pleased to announce my latest project: delete, accept, and deny cookie stamps! for generations, bakers have used cookie stamps to decorate cookies and other treats. 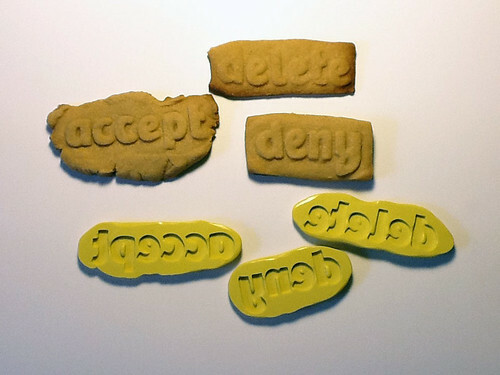 now, traditional baking meets in the internet age in the form of these hand-made silicone cookie stamps, which enable you to bake your own delete cookies, accept cookies, and deny cookies, perfect for your next LAN party or IT department meeting! i'm selling these cookie stamps at my brand-new etsy shop, where you can get a set of all three for just $9.95 plus shipping. i've also set up a page here with baking tips and links to recipes (like these delicious maple butter cookies), in case you've never rolled out cookie dough or used cookie stamps before. late last night, i pointed out that advance indiana's gary welsh had fallen for a ridiculous satire about president obama's birth certificate. in my post, i wondered whether gary would post a retraction—and figured he wouldn't, since he has never retracted anything in his years of printing misinformation. in a post that ironically begins "I know I am as cynical as they come", gary welsh of advance indiana proceeds to fall hook, line, and sinker for a satirical article which claims that a group of high school students have discovered president obama's long-form birth certificate to be a fake. the article was posted at the san diego reader's satire section, which is titled SD ON THE QT - ALMOST FACTUAL NEWS. so now we return to the eternal question: will gary welsh post a retraction? i had a bit of a surprise during my evening commute last night. as i headed east on W 79th st, i discovered that the road was covered with some sort of black substance. i couldn't tell what it was, but it was obviously very sticky because as i drove over it, my tires made a ripping sound so loud that it drowned out the engine noise of my 10-year-old car. this continued for a good half mile until 79th ended and i turned onto spring mill. Melting sealant on the roadway is causing rush hour traffic issues on a mile-long stretch along a Westside road. Sealant that was used to fix cracks in the roadway before winter was heating up and turning into to a sticky form that was getting all over motorists cars, said Mike Pruitt, Wayne Township Fire Department spokesman. there was just one catch: the article said the melting sealant was on high school road, which is miles away from 79th st. clearly this was happening in more than one place. i shot reporter gretchen becker a quick email about my experience, and she wrote back to let me know she'd pass it on to DPW. Indianapolis officials are investigating why recently repaved potholes left a gooey substance on vehicles throughout the city. The Department of Public Works said in a release that crack sealant was bleeding on various streets. Crews are placing sand over areas of concern today, an effort that began late Wednesday after the city learned about the problem. Early reports indicate that rainy weather followed by a rapid rise in temperatures could have contributed to the bleeding sealant. Motorists with damaged vehicles should call (317) 327-4039 for information about filing a claim. it remains to be seen how extensive a problem this is. we don't know how many crews used this apparently-defective sealant, nor for how long, nor how prone to melting it really is. this could be a freak happening that is out of the news within a day or so. primary elections are today in indiana. i'm not enough of a party wonk to get excited about primaries, but i have been intently following one race: the republican races for city-county council, where perennial also-ran jocelyn-tandy adande has been vying for an at-large seat. jocelyn-tandy is no stranger to local politics. a former democrat, she ran in the democratic primary against the late julia carson in '96—her crushing defeat inspired an epic grudge and countless conspiracy theories about "the carson machine". she lost another landslide primary against bart peterson in '99. and she was involved in one of local democrats' most embarrassing fiascos of the last couple decades: she was the campaign manager for bob hidalgo kern in his disastrous run again dan burton. i first became aware of jocelyn-tandy via the indy star's long-deleted INtouch blog, where her writings were so over-the-top that she was kicked off the blog and her posts were excised. from there, she degenerated to copying and pasting her tirades in the comments sections of various right-wing blogs, having long since realized that the republican party was a better place for homophobes like herself. she's been a republican for years now. this year's primary isn't even her first as a republican—after julia carson passed away, jocelyn-tandy ran (and lost) against jon elrod to become the republican nominee to replace her. but local republicans, terrified that the ballot's alphabetical order would let her eke out a victory over their chosen slate, sent out an attack mailer against her, complete with unflattering photo. the mailer accuses her of being some sort of liberal plant (as opposed to the die-hard social conservative that she is) who changed her name to trick voters (arguably true, but it happened more than a decade ago). are republicans right to be concerned? will jocelyn-tandy finally win a primary election, after 15 years of trying? we should know in a few hours!